had M. Stride is an honours graduate from Memorial University of Newfoundland’s School of Music and Faculty of Education. Under the direction of Diane Loomer, Chad was a member of the National Youth Choir of Canada. In 1995 he founded Cantus Vocum Chamber Choir. He has served as accompanist for the Memorial University Chamber and Festival choirs, and the Philharmonic Choir of the Newfoundland Symphony Orchestra. 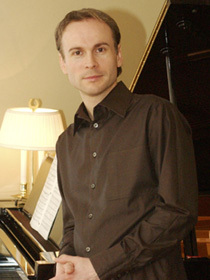 He was also the associate conductor and accompanist for the 1997-98 season with the Newfoundland Symphony Youth Choir. Chad maintains private piano and voice studios, is Organist and Choirmaster for Wesley United Church and serves as a Clinician and Adjudicator. Chad served on the board of directors for the Association for Canadian Choral Conductors. In 2014, upon completion of an MMus in Choral Conducting, Chad was awarded the medal for Academic Excellence from Memorial University.